The other week I was taking public relations pictures for a hotel in Bath. Their staff were volunteering to help at a local soup kitchen for the homeless, and they wanted shots of the volunteers and organisers preparing to hand out the food. I was told by a volunteer from the local church that was involved, I should avoid taking pictures of any homeless people as it might upset them. I’ll be honest, I felt a little patronized as I think by now I know what to do in delicate situations, but I got on with arranging the shots I needed. It was so dark, it would have been impossible to take pictures without flash so I was only ever going to take pre-arranged photos. The PR photos went well, and I used a small portable lighting system to try to make things look brighter and more inviting, and as I finished I turned around to find a man going by the name Squirrel sitting behind me. He was hoping to have his photo taken too, so I included him in some shots. Then his girlfriend, Hayley, came over. All she wanted was a nice photo of her and Squirrel together, and it was a pleasure to oblige. I did ask if they would mind me blogging the photo and they were fine about it, so here it is. Squirrel and Hayley, eating out together. 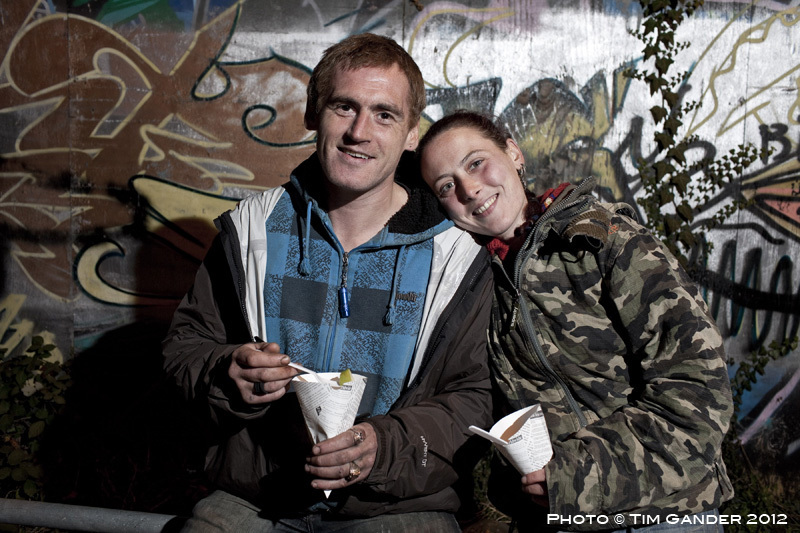 “Squirrel” and Hayley, Bath soup kitchen. The annual tradition of municipal Christmas light switching-on ceremonies has now been joined by a new yearly tradition, that of harassing people who take photos at the events. This year’s winner of the PhotoScrooge Awards (TM) is Merthyr Tydfil County Borough Council, according to reports in Amateur Photographer, as freelance photographer Andrew Bartlett was approached by undercover security (council worker dressed as an Elf) while he was taking photos at their public event. I won’t go into more detail of the story here as you can read all abaht it on the AP site, but here I want to look more closely at the statements subsequently issued by the council. Part of the problem is that the council press office have issued a statement in which they say that anyone using a camera at council-run events should apply in advance for permission. That would include parents taking photos of their own children, which is clearly a nonsense and I’m sure the council will end up not requiring a form to be submitted in advance of any parent with a camera. Or anyone, for that matter. The other problem is they say they have a close working relationship with amateurs who share their pictures with the council in return for a byline. ‘To clarify what seems to have been misrepresented and misunderstood on this issue, the Council, as a corporate parent takes a sensible approach that is intended to safeguard both the subjects and the photographers. I have no idea what a “corporate parent” is, but it sounds positively Orwellian. I’m glad Merthyr council isn’t my mum or dad. Seriously though, the council wants to put barriers up to professional photographers covering events by having them fill in paperwork in advance, which for most freelancers (as most photographers are now) simply isn’t practical, yet they’ll allow un-trained amateurs who probably lack even the most basic public liability insurance to snap away because the pictures are free for the council to use. The council may think it’s a great way to save money, but this ignores the fact that paying photographers for a professional service puts money back into the local economy. Photographers are also shoppers. They also buy food and eat out locally. They buy Christmas presents in local shops and visit local attractions. Quite apart from the complete nonsense of Merthyr Landfill council’s approach, they’ve taken a view on the value of photography which is an insult to the professionalism of many photographers and also damages the local economy. Quite a feat to hit so many birds with just one stone.